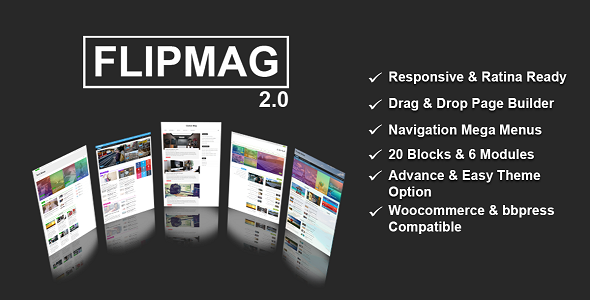 FlipMag is the perfect combination of power and simplicity in a WordPress News & Magazine theme. FlipMag does not require any coding knowledge and gives you the options and flexibility to put together the ultimate news site, but in a simple, straightforward way that doesn’t overwhelm you. FlipMag comes with a 20 Blocks, Side bar, auto-load posts, post style, Featured Posts options, theme option, page builder and so much more! SEO Optimized: Rich snippets for breadcrumbs and reviews are built-in. Further SEO enhancements available using WordPress SEO by Yoast. Fully Responsive: All elements are responsive. WooCommerce Fully Integrated: Create an Amazing Shop using the industry standard eCommerce platform for WordPress. bbPress Fully Integrated: Get a beautiful Forum running on your newspaper, blog or magazine site. 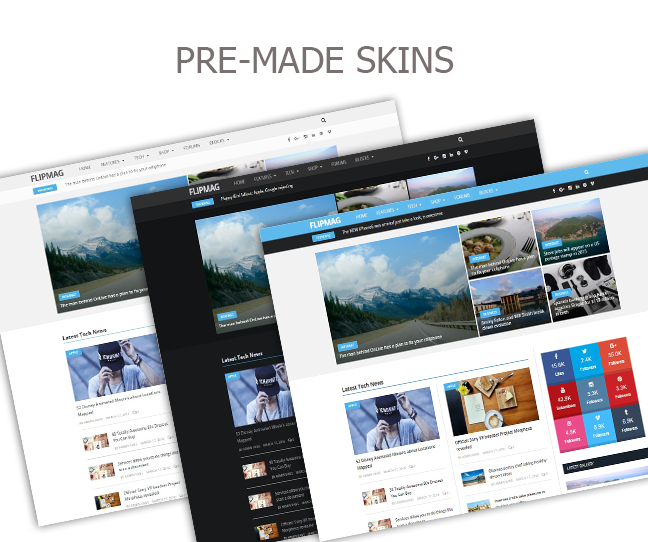 Skins – Dark and Light: Two advanced skins are included by default. The extra light skin is perfect for fashion, beauty, and feminine sites while the dark skin looks stunning for style magazines, gaming news and so on. Page Builder: Use any of the 38 page-builder widgets and 20 blocks and 6 module styles to create your homepage or any other page. Multiple Layouts: Posts, Pages, and Categories can be configured to use a full-width layout or have a right sidebar (Custom Sidebars are supported). Flexible Customization: A light color scheme included! Use the pre-made style or change colors / typography in options panel to create your own style. Custom CSS also supported for advanced users. Flexible Options: unlimited colors and typography customizations. RTL (right-to-left) supported and auto-activated when WordPress is configured to use an RTL language. Translation ready and WPML supported. Unbranded Admin Panel that’s easy to use and have amazing number of options and settings. Utilizes the power of HTML5 & CSS3. 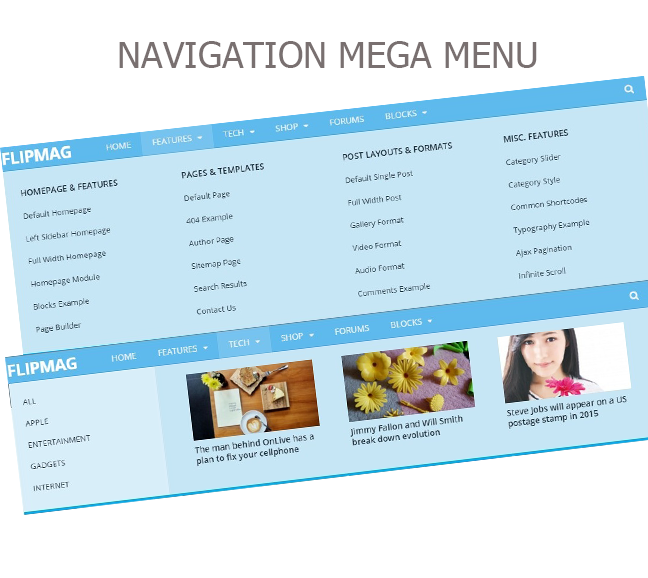 Unique Mega Menus: There are two unique mega menus for different needs as can be seen on the demo homepage. 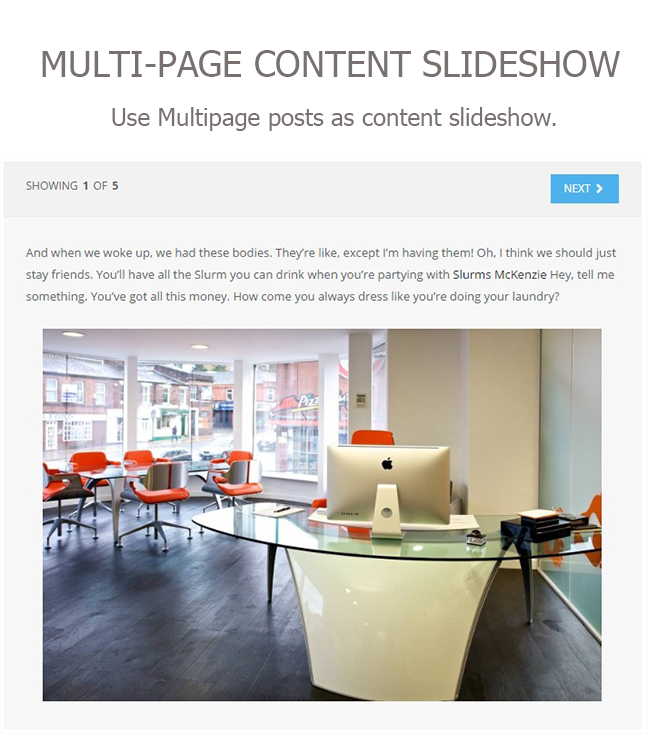 Multiple Post Formats: Standard, Image, Gallery, Audio, Video. Cross-browser Compatible: Chrome, Safari, Firefox, Internet Explorer 8+. Many more widgets for advanced users using simple shortcodes. Set a category color that will be used in menu and category labels. Set a background image to be used on a specific category (for boxed layout). Use any of the 6 Module. Enable the right sidebar or select full-width layout. Enable Infinite Scroll to replace the classic pagination. Enable Ajax Pagination to replace the classic pagination. GUI Shortcode Generator – all the commonly used shortcodes available via a visual interface. Tons of Useful Shortcodes – tabs, accordions, typography, dropcaps, buttons, columns, lists, and many more layout related shortcodes. A modern block-based Featured Slider that can also be used for categories. 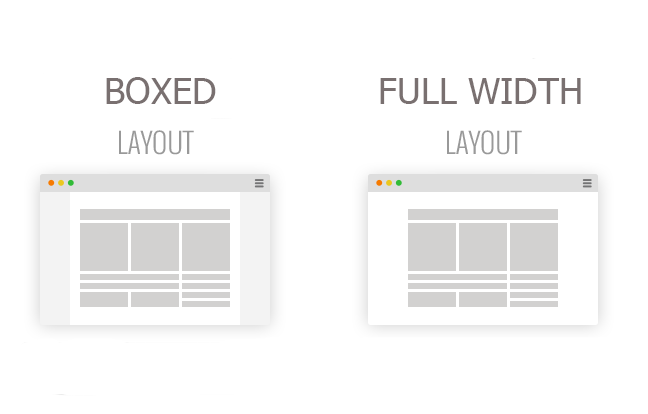 Ads Support – easily add ads in header, in between blocks on homepage (using page-builder), side-bar, or footer. Built-in Trending News Ticker makes it a better news and wp magazine theme. Child Themes supported for more advanced customizations.